Introduction: You can get your news anywhere, but when you want to know what is going on in your local area, the best source you have is the local news reporters that report for your local station. You can read blurbs and items online, but you get the best information by watching the news each night. It may seem, especially on some small stations, that there are no requirements to become a news reporter, but that is not true. These folks really do care about the news, and they are often the ones going out to find out what is going on. 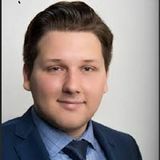 Mark Suleymanov is a Sports News Reporter in New York. 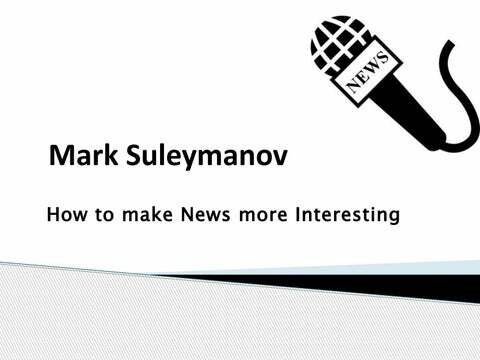 Here he has discussed how to make the news interesting and catchy. Listify: Lists are an incredibly popular way to present information on the web. You can apply the list treatment to almost anything. New political scandal? How about the Top 10 most scandalous political scandals? New smartphone? How about the 10 smartphones that changed the mobile game? Presenting this as a slide show, or spreading it across multiple pages, is also a great idea as it builds the sense of anticipation and encourages readers to click through your site. Top 10s also encourage debate: that "I can't believe they left that out/put that in!" response that could lead to more shares and more discussion. Examine: Sure, one company might just have released the greatest smartphone ever, but simply reporting that fact is about as vanilla as it gets, and your story is going to be up against thousands of others all shouting the same thing. It's time to break out the question marks. "What does Company new launch mean for the rest of the mobile phone market. By turning it into a question, you're challenging the reader and inviting a response. By giving quality analysis you are also building a sense of authority - your site no longer becomes a news source, it becomes a place to find out what the news means. Broaden the prospects : It's too easy to place a story into a niche and leave it there. A new tablet becomes a tech story, a new car a motoring story. But you're limiting your market by pigeon-holing your stories in that way. Think of the overlap and broaden the scope of your story to make it reach out to a wider audience. Forecast: Perhaps the toughest one of all as it requires a fair amount of knowledge of your subject in order to sound convincing. But for writers with their finger on the pulse, one announcement can allow you to offer an opinion on what is going to happen next, both in terms of the story that is being reported and what implications it may have going forward. Be careful with this tactic. Educated prediction can quickly sound like guesswork or sensationalism if you lay it on too thick. That's not to say don't take risks in your predictions - this may, in fact, lead to more discussion but those risks need to have some basis in fact or refer to a precedent. Editorialize: Unlike forecasts, offering your estimation is the easiest thing in the world to do. Again, there are some risks - if your opinion is so left-field it makes you look like a crazed idiot, for example - but if you alert the reader to the fact this is just what you think or how an announcement has affected you then you can pretty much let your mouth - or fingers - run wild. So that's it. One man's news story is another man's news story with bells, whistles, and links aplenty. With a little planning and research, your telling of a story could trump the competition and see you grow your audience, or at least presenting a different side to something that can quickly become white noise. Now, go forth and newsify.